Perform transactions on your NMCU accounts at 5,600 branches nationwide using the Credit Union Service Centers (CUSC) shared branch network. Enjoy expanded evening and weekend hours. Deposits, withdrawals, loan payments, check cashing (check holds will apply) and more are available. Some shared branches also have foreign currency exchange services available. To conduct transactions at these locations, you will be required to provide your account number and a valid picture ID. Services not supported by the shared branch network include loan applications, new account opening and opening/closing CDs. To find a branch near you, go to the shared branch locator. Many banks charge for the use of their ATMs. These charges typically range from $1.00 - $4.00. Northwestern Mutual Credit Union owns the three ATMs on the Northwestern Mutual Campus. All three ATMs are surcharge-free. Consult with your card issuer regarding any fees that they may impose for card use. To limit the surcharges being paid by our members, we have joined two national ATM networks that allow Northwestern Mutual Credit Union cardholders to perform surcharge-free withdrawals at over 30,000 ATMs. To locate an ATM near you, click on the logos below. The credit union provides wire transfer services to financial institutions across the country, as well as, in some cases, internationally. We can also receive wire transfers for credit to our members' accounts. 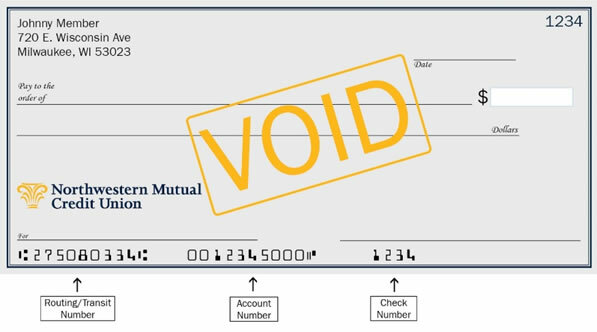 For outgoing wire transfers, accurate wiring instructions from the institution receiving the funds are a must. For your protection, outgoing wires must be requested in person at the credit union office. Telephone requests will not be accepted. Use the wire transfer form to initiate your wire. The cutoff time for outgoing wires is 2:00 p.m. Direct Deposit is a convenient and secure way to deposit your paycheck, pension or government funds. To establish direct deposit, provide your Human Resources, Payroll Department, or check issuer with your NMCU account number in a 5 or 6-digit format, along with our routing and transit number (275080334). If you need help finding your NMCU account number, please call 414-665-3423. NM payroll deduction is a convenient way to make your loan payments or create a savings plan. To establish a new deduction or change your existing deduction, stop in the credit union office. We'll take care of everything! You will be asked by the originator whether you want the item to be posted to checking or savings. The customer name associated with the transaction must be an owner on the account affected or the transaction will be rejected. One free per day. $3.00 charge for each additional check. Payee name required. Up to maximum of $1,000. A fee of $3.00 per money order is charged. Its free! Serve yourself - located inside both branches.